Selling products to make a profit is no longer sufficient. Companies must also appease the human nature of their customers as they are now demanding sustainability, open conversation, helping the community, transparency, and an ethos and mission they can relate to. The book asks four fundamental questions, they are: 1) Do customers care about what the brand stands for beyond just the immediate use of the product? 2) Do customers talk to each other about these higher goals 3) What should companies do to assure their brand is more than a collection of boxes or software code? 4) Does it impact the bottom line? If so, how much? Good for Business is a touchy-feely book which ultimately concludes that companies need have loftier goals than just profit such as donating to charities, volunteer work, and brands that make you feel warm and fuzzy. At first, I groaned when reading the start of the book, having been victim of “do good” speeches when I was in corporate –it always felt like an empty shell. Yet the book started to win me over when the four authors presented meaningful stats and graphs about the growing fickle customer, their desire for brands to be more than just profit machines. Using data they made an argument that companies showing their human appeal a worth while investment. I’m not sold that the earthy huggy ‘humanized brand’ is right for every company, some cultures simply won’t be able to adapt and some customers just want their immediate needs solved. The book also gives dozens of case studies of companies that have an ethos of more than just profit such as: Jones Soda empowers customers by letting consumers pick labels, Ernst and Young connects with their millennial employees talk back by launching an internal community called “Feedback Zone”. The Container Store is one of the top places to work as they allow employees to have flexible hours, How UK’s Innoccent drinks values it’s employees more than sales and profits and dozens of other examples. 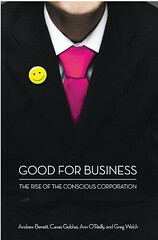 The book Good for Business sets the stage that the world has changed and companies need to change too. It also gives some juicy data points and dozens of anecdotes of companies that have made the leap. It’s well-written, and can be consumed in a few hours. The book falls short in a two ways. While stories are entertaining for a long flight I find myself asking more questions that were unanswered, like: 1) What were the challenges these companies went through during this metamorphosis? What was the common barrier 2) Although there’s a loose framework towards the end of the book, how do I get started? How do I do this? Although a nitpick, while the cover art is catchy, yet the smiley faced button is reminiscent of Walmart (was that intentional?) or the comic book movie The Watchman, which has no relation to this topic. Good for Business asks the right questions, get you thinking, but seems it’s missing a few chapters. The thesis convinces you that changes need to be made, but feels empty, as it never tells you how to do it. I recommend you put Good For Business on your reading list, but read the more important books that give a pragmatic approach. To summarize, I give this book a grade of a “B” or “Four out of Five Stars”. If anything, this book is calling for a sequel to answer these questions. That’s just my take, so I’d love to hear your thoughts on this book, or your comments on similar titles.